November | 2013 | Linden Optometry A P.C. Valid November 29th, 2013 only. Some restrictions apply. Ask optician for details. Discount does not apply to contact lenses or professional services such as eye exams. Cannot be combined with other specials, discounts, or previous purchases. Cannot be used with insurance. 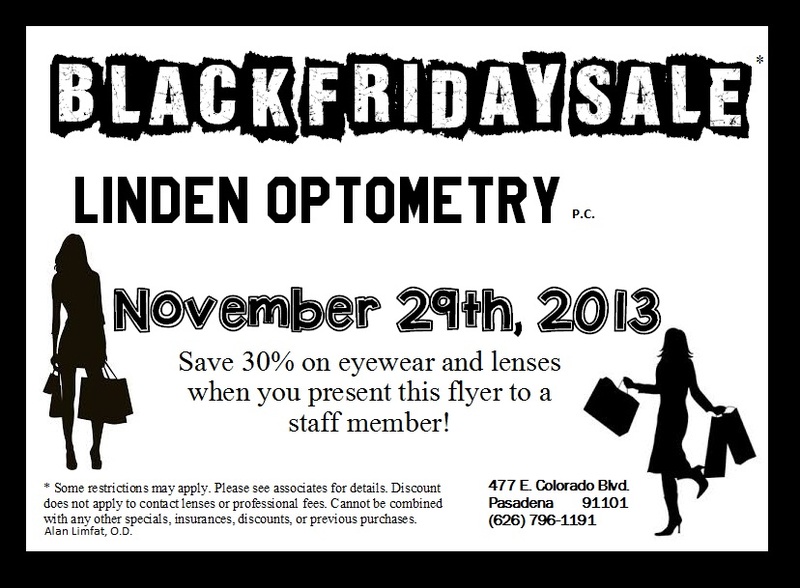 Valid for non-prescription or prescription eyewear. For prescription eyewear, bring your outside Rx, or eye exam available onsite for additional fee. 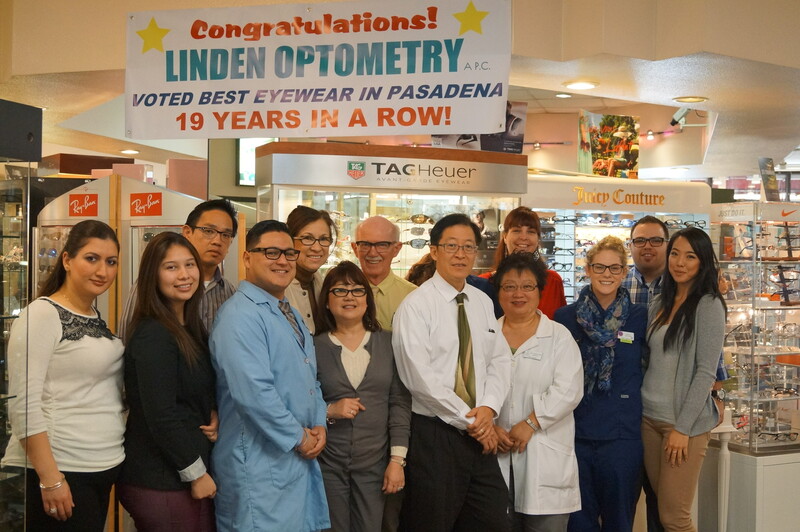 The doctors and staff of Linden Optometry, P.C. are proud to announce that they have been voted “Best Eyewear in Pasadena 2013” by the readers of Pasadena Weekly Newspaper. This marks the 19th Year in a Row! A luncheon celebration was held on Saturday to thank the staff for pulling it off again! Over 50 people attended the luncheon, and enjoyed a meal that included everyones favorite, PIZZA! Dr. Alan Limfat, O.D., thanked the employees for their contributions which made this award possible. Attendees included doctors, receptionists, lab technicians, optometric pretesters, insurance and accounting personnel, opticians, and facilities staff, among others. Linden Optometry, P.C. was voted “Best Eyewear 2013” in the Pasadena Weekly Readers’ Poll. Ericka B. of the Receptionist Department is the Employee-of-the-month for November 2013. She has only been with the company for about 3 months (since 8/22) and in the period of November, she had no errors in her chart paperwork or appointment scheduling. She has not been late once or called out sick at all. Kathy P., the receptionist supervisor, started Employee of the Month as well as other point system incentives to motivate and recognize her team for their hard work. She started in August of this year and tracks employees on their paperwork, phone etiquette, attendance, etc. Each month, she does something special for her recognized employee such as presenting a sash, tiara, or button to them and rewards them with a giftcard to Starbucks. The other receptionists are receptive to this and congratulation the existing Employee of the Month, but also boasts that they will overthrow their reign the next month around. It promotes camaraderie, but it also encourages healthy competition amongst the team.